Meanwhile, the X-Men are training in the Danger Room. 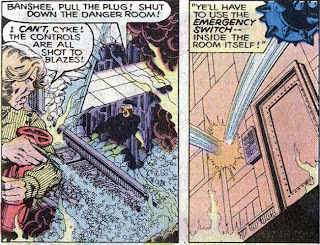 Caught in a trap, Storm panics and loses control, severely damaging the control room and forcing Cyclops to hit the manual override to shut down the room. Questioning her role as an X-Man, Storm goes off on her own, where she is attacked by Arkon. Their fight spills out of the mansion and is joined by the other X-Men. 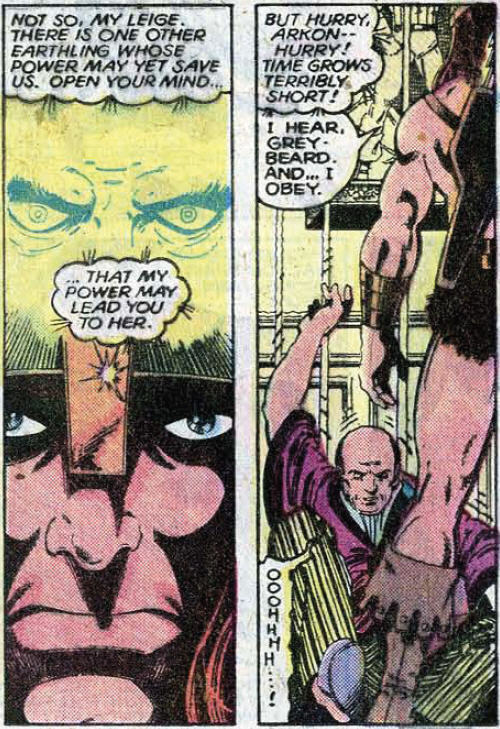 After Arkon hurls one of his thunderbolts at Storm and she disappears, an enraged Colossus overpowers him. Reasoning that the thunderbolt teleported Storm somewhere, Cyclops hurls one at the ground, transporting the X-Men and Arkon to Polemachus, at the center of Arkon's court. 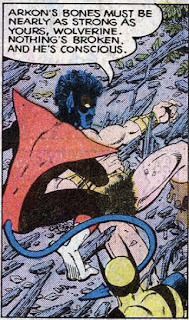 As Arkon's warriors attack the other X-Men, Nightcrawler slips away, following Arkon and the Grand Vizier. 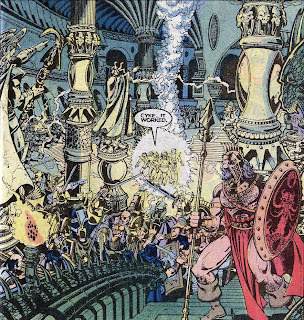 He is led to Storm, who has agreed to help Arkon. 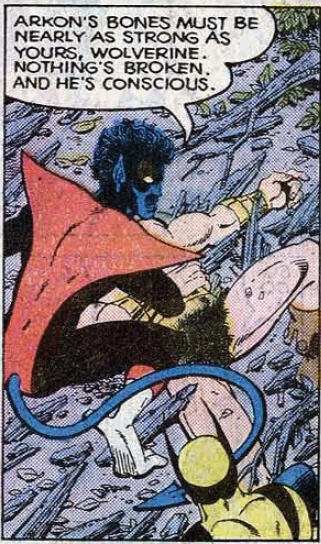 In order to alert the other X-Men to their location, Nightcrawler surprises Storm, who lashes out with lightening. Observing the outburst, Colossus commandeers a dragon and the X-Men fly to Nightcrawler and Storm. Reunited, Arkon explains that his world is powered by an energy ring which surrounds the planet. The energy recently died out, and Iron Man created a device which recharged it. But now the the ring has failed again, plunging the world into darkness. Storm, determined to use her power to do some real good, has agreed to recharge the device with her power, though the effort will likely kill her. 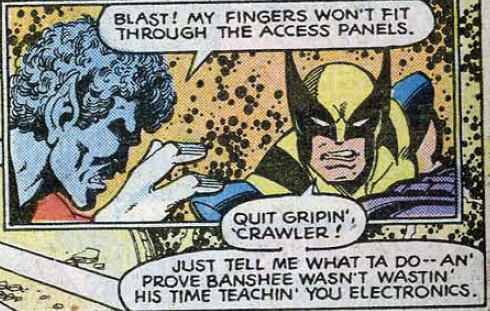 Instead, Cyclops orders Nightcrawler and Wolverine to modify the device to absorb optic blasts instead of lightening. When the device is ready, Colossus grounds Storm, who builds up a massive charge of electricity then transfers it to Cyclops. The supercharged optic blast manages to recharge the energy ring, saving the planet and earning the X-Men Arkon's gratitude. 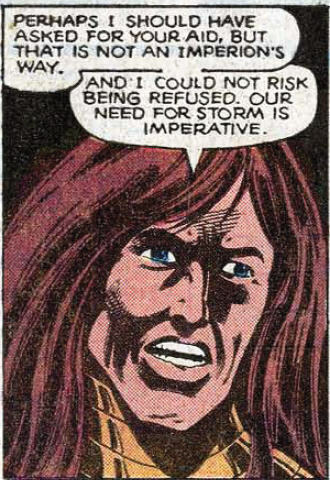 After they decline his offer to fight by his side, Arkon sends the X-Men home. 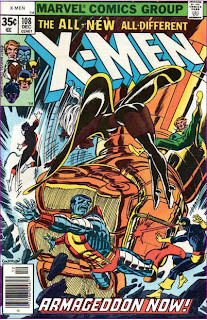 This is the first X-Men annual to contain an original story; both prior annuals were merely collections of reprinted stories. The antagonist of this issue is Arkon, a Conan-like ruler from another planet who previously crossed paths with the Avengers. His schtick is basically that he shows up on Earth seeking help to fix his ailing planet, gets into a fight with a superhero or group of superheroes before everyone returns to his planet and ultimately helps fix whatever the problem is. This is his first encounter with the X-Men, having previously appeared in The Avengers and Fantastic Four. George Perez provides the pencils for this issue, the only issue of X-Men that Perez, a highly-regarded artist well known for his runs on Avengers, the new X-Men-inspired New Teen Titans and DC Comics first universe-altering event Crisis on Infinite Earths, has drawn to date. A footnote in this issue helpfully tells us that it takes place between issues #124 and #125. As such, Cyclops references his belief that Jean and Beast are dead (meaning we have yet another issue of the X-Men hanging out at the mansion and not calling Moira on Muir Island). When Arkon arrives at Avengers Mansion seeking Thor, Jarvis tells him that Thor is off on his own mission. At the time, Thor was hanging out on the Squadron Supreme's alternate Earth, circa Thor #280. The X-Men acquire a handful of Arkon's thunderbolts, used to travel between extradimensional worlds, in this issue. Wolverine and Nightcrawler are tasked with re-configuring the device Iron Man created to help sustain Polemachus' energy rings. 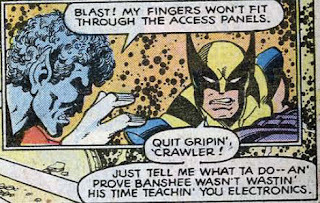 Wolverine says he's a "tinkerer", the first indication we've seen of this, while Nightcrawler's time spent with Banshee repairing the Blackbird (seen in issue #122) is referenced. Nightcrawler notes that Arkon's bones are almost as unbreakable as Wolverine, another nod towards what will ultimately be revealed as Wolverine's skeleton being coated in adamantium. 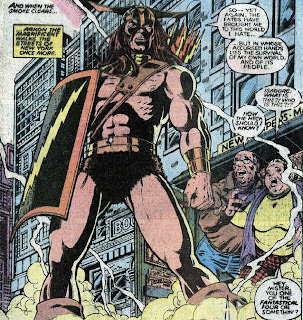 Arkon, in that grand Marvel tradition, attacks everyone he meets upon sight, despite being on Earth specifically seeking help from its super hero population. He admits that it's perhaps not the best approach, but it's how Imperions do things. 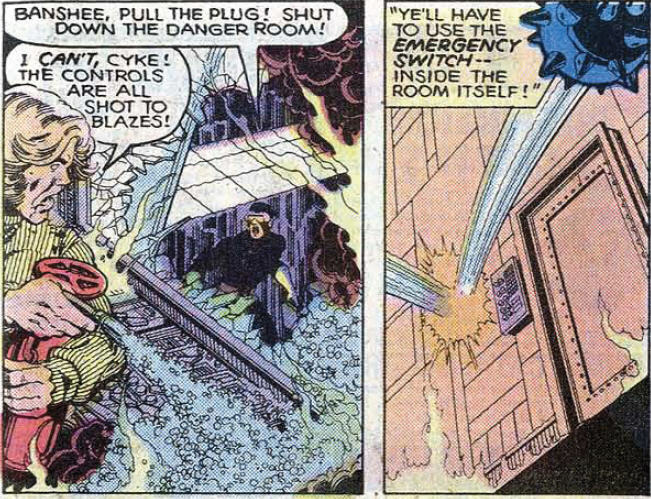 During a training session in the Danger Room, Storm freaks out and ends up destroying the control room, causing the Danger Room to go haywire and forcing the X-Men to try and reach the override switch to shut it all down (which is within the room itself). All of which seems wildly unsafe on multiple levels. Cyclops mentions watching the Avengers battle Arkon on TV "newstape" (which also suggests, if Cyclops is routinely watching footage of the Avengers, he should have seen Beast, alive and well as a member of that team, by now...). More German from Nightcrawler, another "verdammt" and "unglaublich" (unbeliveable), while Colossus drops another "tovarisch". 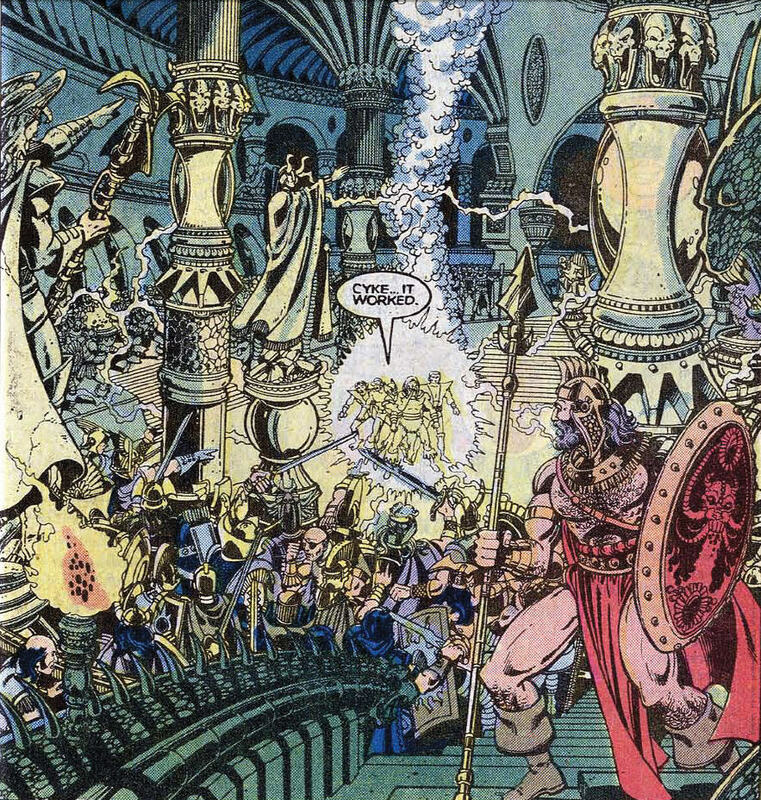 Penciller George Perez and inker Terry Austin are two of the most detail-orientated artists in comics, so pretty much every panel in this issue is packed full of linework, and the backgrounds are painstakingly filled in with little details (such as each book on a bookcase being rendered individually). For the first time since the Silver Age, the fact that Cyclop's optic blast can be diminished through use and requires recharging is referenced, mainly to setup a plot point for this story, in which Cyclops, running low on power on the sun-less Polemachus, gets recharged via Storm's electricity, a process that Claremont describes as akin to "a high-performance engine primed for high-octane premium gas suddenly forced to run on low-octane regular." We also get a neat sequence that shows Cyclops transition from his visor to regular ruby quartz glasses. 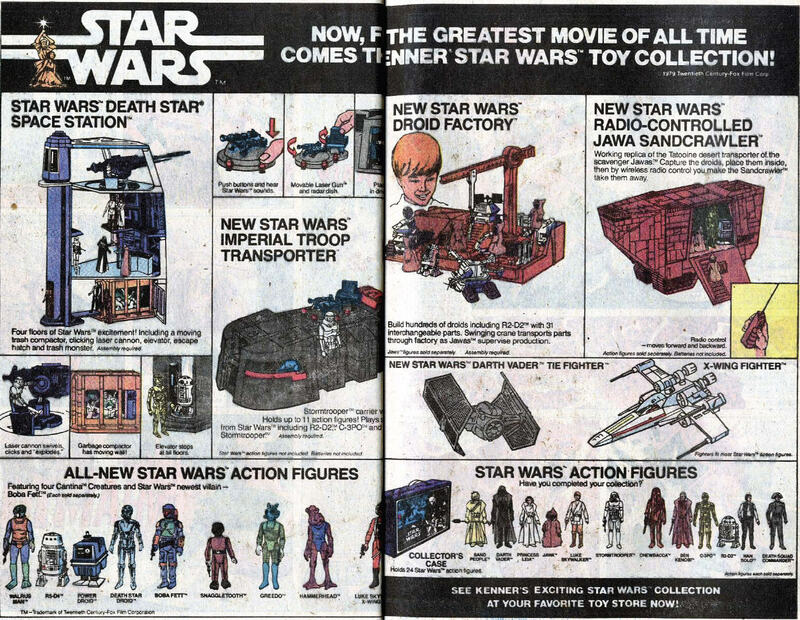 Check out all the Star Wars toys, including a pre-Empire Strikes Back Boba Fett. 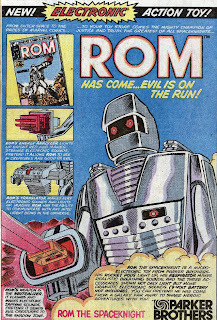 Rom: his toy was pretty lame, but his comic book was pretty good. "I hate the Danger Room. I see nothing wrong with training exercises, but the Danger Room can kill, and I never liked that. Right from the start I didn't like the idea that the failure to pass this particular test carried the ultimate demerit, which was that you die in there. I always wanted to do a story where Xavier got pushed in there by some villain or something and have him survive the danger and then realize how terrible it was and shut it down." Future X-Men editor Bob Harras on his favorite X-Men scene. "There are little moments that I remember, the little graceful notes throughout the years, that you go, 'Okay, that's nice.' For instance, there was a scene between Storm and Scott, I think it was during the Claremont/Byrne run, where Scott is changing out of his visor and into his glasses, and he has to keep his eyes shut really tight while he's doing that. Storm just says to him, 'Scott, is this the life you imagined when you were a kid?' He puts on the glasses, looks at her and says, 'Of course not.' I remember that was such a great little moment, because it explains that they do this because they have to - because it's what life has forced them to do - but they once had dreams of doing other, 'normal' things. I think that's so Marvel in a lot of ways, but it's really so X-Men, too. For some reason that scene, more so than...some other major event, sticks out to me as the kind of thing that makes those characters great." X-Men annuals tend to be pretty hit-or-miss, and unless they're penciled by Art Adams, they're mostly "miss". This is one of the better annuals in the early goings, though it's far from being great. Like many annuals, the story is padded, with an extended Danger Room sequence and some overly-long fight scenes helping fill the pages. The story also suffers from centering on Storm's doubts about being an X-Man immediately after a similar long running subplot involving Colossus was recently put to rest (with Storm herself playing an integral role in assuaging Colossus' doubts). Claremont does attempt to differentiate between the two (Storm is less concerned with being an X-Man and more concerned that being an X-Man is limiting her ability to do more good for the world), but the whole scenario still feels repetitious and somewhat forced. Still, there's plenty to enjoy here. The limitations of the story are helped along by the strong characterization we've come to expect from Claremont by now and the art from George Perez is both a worthy compliment to Byrne's regular work and gorgeous in its own right. If annuals are meant to showcase bigger-than-normal stories, you could do a lot worse than George Perez drawing extradimensional barbarian hordes fighting the X-Men. Some long running plot threads start to come together as Claremont and Byrne kick off their next big epic. I've only read this annual once, when I got the Marvel Masterworks volume that contains it. I've flipped through it a few times since, mostly just to look at the artwork, but I never re-read it. I don't think that's because I disliked it though, but more because I don't usually grab one issue to read. I read entire runs at a time, and I just haven't gotten back to the Claremont/Byrne run in a while (though I flip through it quite often). As I recall, this story was kind of adapted for the 90's X-Men cartoon, wasn't it? I vaguely remember them fighting animated Arkon. This was Perez's only X-Men issue, as you note, and according to Claremont in the introduction to that same Marvel Masterwork, this was the only time he ever even worked with Perez! It seems odd that two of the biggest stars of the late 70's/80's only worked together once. Perez did draw at least two covers during this era, though -- the one where Magneto is forcing Wolverine's claws towards his face, and one of the upcoming Proteus issues. 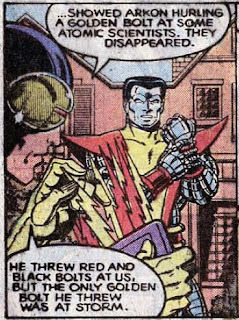 "The X-Men acquire a handful of Arkon's thunderbolts..."
Which shall henceforth be known as "Cyclops's thunderbolts". I've always thought it was funny that he becomes the designated user of those things. Whenever the X-Men need to go to another dimension -- which only happens in annuals, of course -- Cyclops whips out his sack of thunderbolts and leads the way. They should've added that ability to his Marvel Handbook entry. 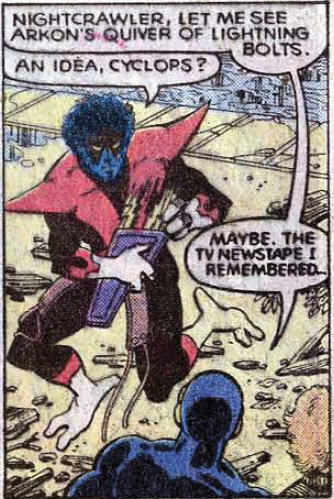 "Cyclops mentions watching the Avengers battle Arkon on TV 'newstape'..."
Maybe that's why I've mentioned this plot hole a couple of times. Could be I read that a long time ago and got it ingrained in my mind. It certainly makes more sense than my having an original thought! "The Awesome and Terrible Power of Cyclops..."
I love how powerful Claremont makes Cyclops out to be in this part. I always thought Byrne was the bigger Cyclops champion on their team, but since he had no involvement in this annual (other than apparently secretly inking one page), I guess Claremont thought he was pretty powerful too. Normally in a Claremont-written story with no other input, I expect Storm to be the big star who saves the day. Speaking of Storm, isn't this the first of many, many times that someone tries to take her as his queen? It amazes me how many times Claremont used that particular plot. We get it -- men of power are attracted to her! The point would've been made after the first two times it happened. There was no need for the next ten. I liked that quote from Bob Harras. He never gives many interviews. I believe I read in an interview with one of his former editors that he preferred to let the work speak for him. In a way, he's totally the opposite of Quesada. Even DeFalco and Shooter had Bullpen columns. Harras usually didn't do any of that stuff. But as I said before, he was very nice when I met him at Comic-Con once. Anyway, I should get Comics Creators on X-Men. I have the Spider-Man one. I know there's a Fantastic Four one, too, but I'm not too interested in that. i have absolutely no idea how storm's electricty would recharge scott instead of exploding his heart. I don't buy that at all. Just like how i didn't buy her using electricity under water. It's like claremont has no real understaning how lightning and electricity work in the real world. Speaking of artists rarely seen in the X-books, the cover for this issue was drawn by Frank Miller. @Matt: As I recall, this story was kind of adapted for the 90's X-Men cartoon, wasn't it? I vaguely remember them fighting animated Arkon. 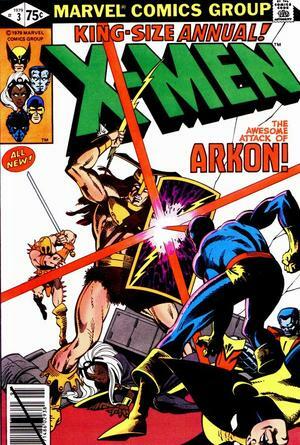 I recall the X-Men fighting an animated Arkon, but I don't recall much else, so I don't know how closely they adapted this issue (as opposed to the general idea of Arkon or a different specific issue). But they were surprisingly faithful in adapting a lot of the Claremont stories, so it wouldn't surprise me. They should've added that ability to his Marvel Handbook entry. Ha! Yeah, they should've. I love that he becomes the designated bearer of the thunderbolts when his initial use of them is based on nothing more than observation and some slightly dodgy deduction (I mean, it's not a HUGE leap to think that Arkon teleported Storm away rather than, say, atomized her into oblivion, but it's still a leap...). It is kind of funny, considering how relatively minor they are, but I always think of this issue as "the one where Cyclops gets Arkon's thunderbolts". Probably because I read the annual where he next uses them first, and thus my first association with this issue was the footnote referencing it. I guess Claremont thought he was pretty powerful too. Yeah, I've always heard Byrne called the Cyclops enthusiast too, but I really think Claremont liked him too. He gave him plenty of cool moments independent of Byrne, and I've read that Claremont was incensed by how much of heel Cyclops was portrayed as in early X-Factor issues, following Jean's return. Speaking of Storm, isn't this the first of many, many times that someone tries to take her as his queen? Yeah, I think it is. I was going to point it out, but I think of that Claremontian tic more in terms of Storm herself getting attracted to powerful villains. I know she mentions it in regards to Doom at one point, and I think she becomes attracted to Arkon during his next appearance in an annual. At any rate, yeah, "Storm getting taken as someone's Queen" is definitely a meme we'll need to watch out for and note going forward. It's ridiculous how often it happens. In a way, he's totally the opposite of Quesada. Even DeFalco and Shooter had Bullpen columns. Harras usually didn't do any of that stuff. Ditko is who I always think of in terms of "letting the work speak for itself" guys, but you're right, Harras definitely fits that bill. I always attributed his lack of "Bullpen Bulletins" to how the industry had changed by the time he was EiC, but now that you mention it, it was probably just a personal preference on his part not to do them. I have the Spider-Man one. I know there's a Fantastic Four one, too, but I'm not too interested in that. I've got all three, but I really wish they'd done an Avengers one. I'd probably have started an X-aminations-like series of posts for Avengers by now, if they had. @Sarah: i have absolutely no idea how storm's electricty would recharge scott instead of exploding his heart. I think the idea we could take away from it is that Cyclops' mutant power allow his body to metabolize energy (be it solar, electrical, etc.) and convert it to his optic blast (solar being the easiest, electric being possible but dangerous/painful). @Ugus: the cover for this issue was drawn by Frank Miller. Ah, yes! Thanks for pointing that out. Other than a few covers and the Wolverine mini, he didn't do any other X-stuff, did he? "...made me laugh out loud." It's funny 'cause it's true (albeit exaggerated). "Yeah, I've always heard Byrne called the Cyclops enthusiast too, but I really think Claremont liked him too." I think the reason I've often thought that Claremont didn't care as much for Cyclops is the fact that he eventually wrote him out of the series. Why get rid of a character if you like them that much? In more recent years, having read various interviews with Claremont, I've gathered that he assumed he would still have control over the character, and would bring him back for anniversaries and such (as he did in issue #200 and its build-up). He just felt he'd had his time to shine, and wanted to give him a "happy ending" before moving the spotlight to others. The thing is, somehow I find it very hard to imagine that, if he had complete creative control (i.e., character popularity among readers was not a factor), he would have eventually written Wolverine or Storm out of the series. They just seem too much like his "favorite children". Anyway, this also partially stems from Cyclops being my favorite X-character, and, even though I appreciated that Claremont gave him that happy ending (at the time), I really feel the title became much less enjoyable when he was gone. But Claremont was evolving at that point anyway, so I could have felt the same way even if Cyclops had stayed. But those thoughts can wait until you get to issue #177 and beyond! "Plus, that makes him sound an awful lot like Bishop, which is never a good thing." Hey, speak for yourself! The scene in "Fatal Attractions" where all the energy wielding X-Men supercharge Bishop so he can fight Magneto is one of my very favorite moments in all of X-history. I also really love the scene where Bishop saves the X-Men from Onslaught, completing his "X-traitor" storyline. I miss Bishop... after Lobdell left, no one seemed to know what to do with him, and now he's become basically a villain (and for no good reason, a cyborg). @Matt: He just felt he'd had his time to shine, and wanted to give him a "happy ending" before moving the spotlight to others. That's always been my understanding too, though you bring up a good point about how Claremont never went that route with Wolverine and Storm. But I think Claremont does kind of downplay Storm for a bit: after she loses her powers until she fights Cyclops for leadership of the X-Men in #201 (one of my least favorite issues), she's largely out of the spotlight. Certainly not to the extent that Cyclops is from #177-200 (she at least gets some subplot time and few spotlight issues during her time away) but Storm is largely cutoff from most of the main X-Men action from #186 to 201. Wolverine, of course, never gets to fully escape the spotlight or the main action. I feel like if there was any time that Claremont might have wanted to downplay or retire Wolverine, it was around the time of his solo series and the whole "Dissolution and Rebirth" story in Uncanny (when, like Storm in issues #186-201, Wolverine is relegated to side stories and occasional spotlight issues while other characters took the focus). But by then, Wolverine was too popular to be off the book entirely (even if he had his own book, too), and Claremont wouldn't have had enough clout to fight for writing Wolverine out, assuming he even wanted to. I dunno, maybe I'm reading too much into it, but I definitely think you could make a case that Claremont was at least open to the idea of letting Storm and Wolverine leave the books for chunks of time or retire a la his intentions for Cyclops, but was never able to commit to it fully (either by his own doing or editorial's). even though I appreciated that Claremont gave him that happy ending (at the time), I really feel the title became much less enjoyable when he was gone. It's funny, because even though Cyclops is my favorite character too and I also miss him when he's gone, at the same time my all time favorite run of issues is probably #168 to the Mutant Massacre, which is very Cyclops-lite. Ah well, like you said, something to consider when we get to that point. I miss Bishop... after Lobdell left, no one seemed to know what to do with him, and now he's become basically a villain (and for no good reason, a cyborg). Um, because cycborgs rawk, duh! Seriously though, my anti-Bishop sentiments are largely a result of his post-Onslaught characterization. I too enjoy those moments you referenced (and liked his role in AoA), but I felt like after he saved the X-Men from Onslaught and averted his future (and after Lobdell left) no one really knew what to do with him, so he got caught up in all kinds of crazy/lame stories (romances with Deathbird, extended jaunts into different, alternate futures, etc). I kinda liked the whole mutant cop/District X angle, but then that all got tossed out the window in favor of crazy, genocidal, one-armed, hunting a baby Bishop. So basically, I'm not a huge Bishop fan, despite enjoying him, in general, pre-Onslaught. "Wolverine was too popular to be off the book entirely ... and Claremont wouldn't have had enough clout to fight for writing Wolverine out..."
It never ceases to amaze me that when the X-Men were at their commercial height, when Wolverine was a main character on the very popular cartoon series, the X-Office actually got permission to write Wolverine out of the two core X-books for something like a year, right after "Fatal Attractions". Say what you will about the 90's X-Office, but that move had to take some guts, if only to sell it to the suits upstairs!! There's no way that would ever happen nowadays. "So basically, I'm not a huge Bishop fan, despite enjoying him, in general, pre-Onslaught." Okay, as long as we understand each other. @Matt: Say what you will about the 90's X-Office, but that move had to take some guts, if only to sell it to the suits upstairs!! There's no way that would ever happen nowadays. Definitely. You get the impression these days creators couldn't sell Marvel on limiting Wolverine's appearances to one or two titles, let alone writing him out entirely. Indeed. Don't worry, once we get there, you'll see that I can be a pretty big 90s apologist (not that I think much of it needs to be apologized for); that is the era when I first discovered the X-Men, and I still hold a fair amount of it in high regard despite some of its faults. "Definitely. You get the impression these days creators couldn't sell Marvel on limiting Wolverine's appearances to one or two titles, let alone writing him out entirely." As I recall, just a few years ago there was some mandate that Wolverine would only appear in Astonishing X-Men, but neither of the other two X-titles. Of course he still showed up in New Avengers and his own two (!) solo titles, but there was at least some tiny attempt to reign him in. It obviously didn't last long... and there was no reason it should have, really. It was an artificial mandate: "Wolverine's still on the X-Men, but he only hangs out with these specific characters." Whereas with the "Fatal Attractions" aftermath, he was written off the team entirely, which made a big difference. And during the latter part of Claremont's run that you mentioned, he hung out with just Psylocke and Jubilee due to the story separating that trio from the rest of the X-Men (such as they were at the time). Both those occasions felt organic, as opposed to the more recent attempt, which just seemed like a lame, half-hearted attempt to appease those of us who felt the character was way too overexposed. It's amazing that I can now look back on the early 90's and laugh at the idea that anyone thought he was overexposed then! We hadn't seen anything yet! Side-note: As I was typing the above, it occurred to me that a story like the X-Men's "world tour" could almost never happen now. For one thing, each stop would be a multi-part story arc, so the whole thing would take a few years to complete. And on top of that, you certainly couldn't let Wolverine go along, since he'd be unavailable for guest appearances elsewhere (though it's more likely his absence would just be ignored if another writer wanted to use him elsewhere). Comics has been a very commercial business for a couple of decades at this point, but somehow it feels more commercial now than ever before. Maybe I'm wrong; maybe it's just that I'm noticing it as an adult for the first time. But it's kind of sad. Wolverine has been overexposed for a long time now, but it just feels so much more blatant and unapologetic these days. @Matt: It's amazing that I can now look back on the early 90's and laugh at the idea that anyone thought he was overexposed then! We hadn't seen anything yet! Boy, ain't that the truth. And you're right: arbitrarily confining Wolverine to one X-book isn't the key to limiting his exposure. Heck, forget the team books; if they truly wanted to cut back, try not publishing three Wolverine solo titles and a host of minis and one shots every month. Definitely. They'd do the "World Tour" story, but like you said, it would last for years, publication-time, and the whole thing would have to get crammed into a tiny period of time, comics-time, to account for the host of appearances Wolverine would have made in other books while touring the world with the X-Men (kind of like how the end of Whedon's Astonishing got skunked by the delays forcing his characters to appear in other X-books after the events he had yet to depict in his book). Comics has been a very commercial business for a couple of decades at this point, but somehow it feels more commercial now than ever before. Maybe I'm wrong; maybe it's just that I'm noticing it as an adult for the first time. I definitely think that's part of it. I know that as I've gotten older, a lot of the "man behind the curtain" type of stuff has become more obvious (I used to naively think stuff like Onslaught was all part of someone's intricate plan; then I read an interview with Lobdell where he talked about just tossing the name out there and worrying about coming up with a story for it later), but I also think the internet/modern hype machine has a lot to do with giving us those peaks behind the currents that readers in years past never got. Time was the comics press was limited to some fanzines, but nowadays, with blogs and Newsrama and CBR and whatnot running interviews, solicitations, etc., the commercialism seems a lot more apparent. We can now all look inside and see just how many decisions are made based solely on financial considerations, and while that's probably always been true, comic readers before never had the kind of access we do today. But I also think the industry has changed, especially since the "bubble" burst in the late 90s. Byrne has talked about how, in the "old days", creators would call dibs on a hero or villain who wasn't being featured elsewhere, and editorial would make sure no one else would use that character. I just don't think that happens nowadays. To start with, every character is someone's favorite, so why not feature him or her in as many places as possible? Secondly, with the industry nowadays SO creator driven, to the point that in some cases creators sell more books than the characters do, no editor is going to tell a superstar writer or artist they can't use Character X just because someone else (usually a lesser creator who draws fewer readers) has plans for him. It used to be (especially under Shooter) that the editors, with the EiC at the top, were responsible for maintaining the cohesion and integrity of the shared universe. Nowadays, it seems like the editors are there just to hype stuff and get out of the way of the writers and artists, and it's left to the fans to make some sense of the shared universe and figure out the sequence of Wolverine's umpteen appearances in any given month. But you're right: ultimately, it all comes down to money (like most everything). Marvel makes money off all those Wolverine books, otherwise, they wouldn't publish them. Bottom line, that's what's most important to them. Back in the day, their business model suggested that limiting his appearances yielded greater sales (if people want Wolverine they'll HAVE to buy X-Men); now, they clearly believe otherwise (enough people will buy Wolverine no matter how often he appears so as to be profitable, so we'll put him everywhere). That said, there's still some glimmers of the "old ways" out there. Marvel, moreso than DC, I think, has done a good job of integrating the ramifications of its "big events" into the status quo of its books in a way that almost feels like the heyday of the shared universe. For example, during "Dark Reign", Marvel did a pretty good job of making sure each book reflected the setting of "a world run by Norman Osborn" and still manage to tell its own stories, like just making sure characters referred to "HAMMER" instead of "SHIELD" (you can quibble with the logic of putting Norman in charge, but once done, Marvel was, to their credit, committed to the idea, and didn't just ignore that status quo in all but the Bendis-penned books). Which, of course, was still all about money, but in a somewhat less crass/obvious way. After all, all those footnotes we love in old issues were about making money, too; they wanted us to go buy those issues (which is why it boggles my mind that they aren't used more in these ever-more commercial days, but that's a whole 'nother tangent...). "This is the first X-Men annual to contain an original story; both prior annuals were merely collections of reprinted stories." 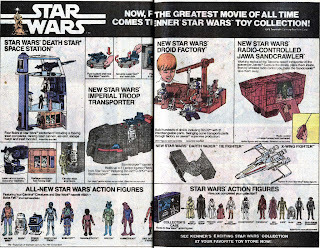 - I remember years ago getting Annual #3 & thinking "Right, let's track the down the 1st two", not realising 1 & 2 were early 70s reprints of 60s stuff. I'd just assumed that Claremont & Cockrum/Byrne had done the two previous ones, and like Giant Size #1 & X-Men #94, they were so collectable you just didn't see them at UK comic fairs! It shows also that, by restarting the X-Men annuals, Marvel realised they had something special on their hands. @Pete: I'd just assumed that Claremont & Cockrum/Byrne had done the two previous ones, and like Giant Size #1 & X-Men #94, they were so collectable you just didn't see them at UK comic fairs! I was similarly hoodwinked back in the day. I had "X-Men Annual 1-2" on my comics want list for years before I realized the two "King Sized Specials" containing reprints that I had seen at various cons were what Marvel considered the first two X-Men annuals. "I used to naively think stuff like Onslaught was all part of someone's intricate plan; then I read an interview with Lobdell where he talked about just tossing the name out there and worrying about coming up with a story for it later." Byrne and Claremont have both said that Jean Grey originally became Phoenix just to power her up to a level where she could fit with the new X-Men. The whole Dark Phoenix thing eventually spun out of that, but they did basically make it up as they went along. In fact, it was kind of the ultimate form of making it up as you go along, as they had to redo the ending at the last minute! I feel like I said this here once before, but Larry Hama has said that he often didn't know how an issue of G.I. Joe would end until he wrote the last page. As much as I like the idea of plotting it all out in advance (as I think current writers such as Bendis like to do), there's something to be said for writing by the seat of one's pants. The Lobdell example is extreme, though, since literally all he had was a name and the idea that whatever "Onslaught" was, it could "stop" the Juggernaut. Making it up is fine, but I feel like you need a bit more to work with that that. However, I thought Onslaught as a story worked out surprisingly well. Certain "clues" had to be disregarded, but the actual crossover event was pretty well worked out and I liked that it drew on a plot point from "Fatal Attractions". I will stand by "Onslaught" as an event till my dying breath! "...it's left to the fans to make some sense of the shared universe..."
And some concscientous writers, usually from the "old school". Chris Claremont and Peter David have both done stories in the past decade explaining or fixing other writers' continuity problems. But a stronger editorial presence would definitely be helpful. I do feel like editorial plays a strong role in enforcing the massive events and their status quos, as you mentioned, but they seem less concerned with character continuity and more concerned with event continuity. I know I can sometimes come across as a 90's uber-fanboy, which is not exactly true, but I will say that in the days of Bob Harras, arguably the most editorially driven period in Marvel history, the character and event continuity were usually both pretty well enforced. There were certainly hiccups, but I don't remember it ever being as difficult to reconcile things back then as it is now. "...their business model suggested that limiting his appearances yielded greater sales..."
Tom DeFalco has said that he used to argue with Marvel's marketing people about something along these lines. Say Marvel published 50 books a month. The marketers would demand they publish 100 books a month to double their sales. DeFalco's argument was that doing so would only erode the sales of the 50 books a month, since not all their readers had the disposable income to read everything they published. All you'd wind up with would be twice as many books selling about half as many copies, and frequently with less quality in the finished product due to dilution of the talent pool. In that sense, I thought bankruptcy was one of the more fortunate things that happened to Marvel -- it forced them to chop their line down to a manageable number of titles. The fact that more than half those titles were X-books and Spider-books was not a good thing, but at least it was a starting (or re-starting) point. Obviously the bankruptcy was terrible for any number of reasons, but to me, this was the silver lining in their financial troubles. 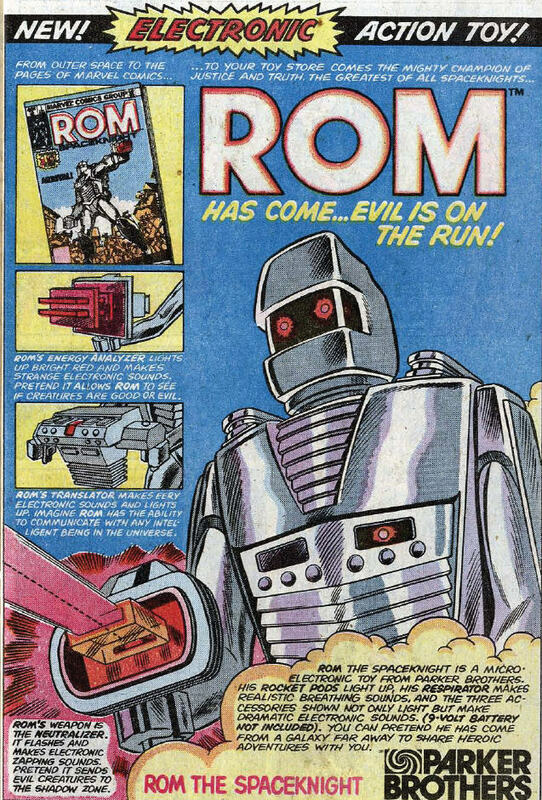 This issue was adapted by the cartoon in a two-parter...and it was terrible. Storm fell in love with Akron and planned to be his queen but the other X-Men found out that Polemachus used slaves from a neighboring planet and had to to prove it to Storm....Jubilee was also heavily featured. @Matt: As much as I like the idea of plotting it all out in advance (as I think current writers such as Bendis like to do), there's something to be said for writing by the seat of one's pants. I've had this discussion numerous times on various writing blogs, but I tend to prefer "planning it all out" simply because that's how I write (I can't imagine sitting down to write a story without knowing how it will end; unknown detours along the way are one thing, but I have to know the final destination before starting), but there's certainly some good things to come out of "making it up as they went along" in comics. Certain "clues" had to be disregarded, but the actual crossover event was pretty well worked out and I liked that it drew on a plot point from "Fatal Attractions". Yeah, if you disregard a lot of the build up clues (like X-Men v2 #50), the whole thing does hold together pretty well from about the point Onslaught actually appears to the end. they seem less concerned with character continuity and more concerned with event continuity. All you'd wind up with would be twice as many books selling about half as many copies, and frequently with less quality in the finished product due to dilution of the talent pool. Call me crazy, but DeFalco's math just seems so correct it boggles my mind how anyone could disagree. Obviously the bankruptcy was terrible for any number of reasons, but to me, this was the silver lining in their financial troubles. It also led to the Quesada/Jemas years, and while I have some issues with things during that time, it was definitely a great period of "what the hell, let's see what happens" creativity that served the company well. @Dr. Bitz: This issue was adapted by the cartoon in a two-parter...and it was terrible...Jubilee was also heavily featured. That must be a later episode, as I only vaguely recall it, and I know the beginning of the series much better than the end. I realize it's years later, but you can scratch at least one of those villain kidnaps Storm to be his queen stories--specifically, this one. They do dress Storm up in some crazy outfit for no good reason, but they're pretty sure she's going to die charging up that machine.